annual Age-Out Ceremony during 2011 World Championships. Drum Corps International invites you and a guest to become lifelong members of the ever-growing community of drum corps fans. If you completed your last eligible performance season with a Drum Corps International unit during the summer of 2011, you're eligible to receive two free tickets to a show during DCI's 40th anniversary season. Previously, these free tickets were only offered for the World Championship Finals, and this year, DCI is expanding the list of shows to choose from. Age-outs in good standing after completing the 2011 season can receive two tickets to their choice of one of the following 2012 DCI Tour events: DCI Minnesota Saturday, July 14 - Minneapolis, MN DCI Southwestern Championship Saturday, July 21 - San Antonio DCI Atlanta Southeastern Championship Saturday, July 28 - Atlanta DCI Eastern Classic Friday, Aug. 3 - Allentown, PA DCI Eastern Classic Saturday, Aug. 4 - Allentown, PA DCI World Championship Finals Saturday, Aug. 11 - Indianapolis "Last August we had more than 200 age-outs take advantage of these free tickets, and by opening the offer up to include many of our other Premier Events, we're looking forward to an even bigger response in 2012," DCI Ticketing Manager Allison Focht said. Learn more and register to receive your free age-out tickets today. 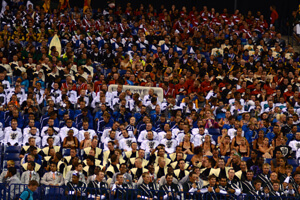 Check out a photo gallery from last summer's Age-Out Ceremony at the DCI World Championships.